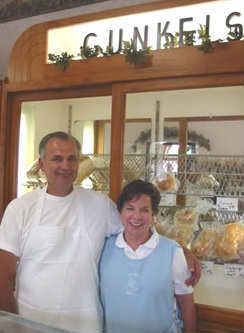 Gunkel's Bakery has been a family-owned business for over 100 years. The current owners, Phillip and Carol Draeger, have been baking here since 1965. 90 miles northwest of Green Bay. All of our baked goods are homemade from our own recipes, using only the finest ingredients. Our breads, bagels, dinner rolls, and buns are made from scratch, using unbleached flour. We have been baking our tasty Flax Seed breads since 1995 the old German way-baking with steam in the ovens. Each loaf takes well over four hours from start to finish. We strive to send you the finest quality baked goods. We accomplish this by shipping them to you fresh from our ovens. Flax Seed, with its inherently beneficial fiber, lignans, and Omega-3 fatty acids, not only protects you from chronic illness and disease, it also helps you manage your weight. Drive-thru service available for added convenience! Please call in your order for faster drive-thru service.